We are a proud part of the Civil Air Patrol. We teach the youth of the South Charlotte/Waxhaw area about leadership, military customs and courtesies, aerospace, and emergency services. We also highly recommend a healthy, active lifestyle. The Composite Squadron of the Waxhaws meets at Cuthbertson High School in Waxhaw, NC and visitors are welcome to join us every Tuesday at 6:15pm. To join the unit, we require perspective members to visit three of our weekly meetings. For more information on the Civil Air Patrol, visit www.gocivilairpatrol.com or contact us using our contact form below if you have any additional questions. The Composite Squadron of the Waxhaws is one of the few cadet-run squadrons in North Carolina. Because it is cadet-run, our youth have the optimal opportunity to learn leadership skills and responsibility. Although our squadron is cadet-run, we have multiple senior members. They are adult CAP members who may be dedicated parents, pilots, missionaries, veterans, or retired teachers who have undergone cadet protection training and been screened by the FBI. As stated above, we meet once a week on Tuesday nights from 6:15pm to 8:45. Each month we spend a meeting on each of the following topics: Aerospace Education, Emergency Services Training, Physical Fitness, and Character Development. Each spring and fall we hold a weekend training session for new CAP members called an Airman Training School. It is supervised by at least 2 senior members and 5 cadet staff. Cadets are taught basic drill movements, aerospace, leadership, care of uniform, and confidence in oneself. In the summer and winter we encourage our cadets to attend encampment, a week long training camp toned down for teenagers, located on a military base. Encampment is much like a longer version of an Airman Training School. It is required for a cadets to promote to the grade of Cadet Second Lieutenant. An encampment will be staffed by highly trained senior members and cadets. Cadets attending encampment will be taught drill, care of uniform, teamwork, motivation, leadership, aerospace, and Air Force core values. Every December, our squadron is represented by a color guard and drill team in the Waxhaw Christmas Parade. Once a cadet has successfully graduated an encampment, he/she is eligible to apply for a National Cadet Special Activity (NCSA). These are special activities offered only to CAP cadets. They are often only a fraction of the price they would be for civilians. Some of the activities include National Flight Academy, Honor Guard Academy, National Blue Beret, Para-Jumper Orientation Course, Hawk Mountain Ranger School, International Air Cadet Exchange, and National Emergency Services Academy. National Flight Academy provides up to 24 cadets with intensive week-long pilot training including 25 hours of ground school and 10 hours of flying a plane. 60% of attendees solo. For CAP cadets, the cost of this training is $800; for civilians, it would be around $6,000. At Honor Guard Academy, cadets spend two weeks being taught drug demand reduction, and learn rifle drill by the US Air Force Presidential Honor Guard. At National Blue Beret cadets staff the Oshkosh Wisconsin Airshow, the largest airshow in the world. With Para-Jumper Orientation Course, cadets spend a week training with USAF PJs. At Hawk Mountain Ranger School, cadets are pushed to their physical limits while learning valuable survival skills and search and rescue techniques. The International Air Cadet Exchange allow cadets who have earned the rank of Cadet Captain to spend two weeks in a different country with other CAP members. National Emergency Services Academy trains cadets for ground team action, search and rescue, and disaster relief. 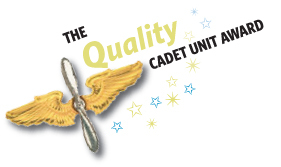 All NCSAs are exciting learning opportunities offered exclusively to CAP Cadets. The first weekend in November our cadets help staff the Monroe Airshow. To prepare them for this responsibility, training on flight line safety is begun in September. There we marshal aircraft, and provide crowd control and aircraft security for multi-million dollar WWII planes.